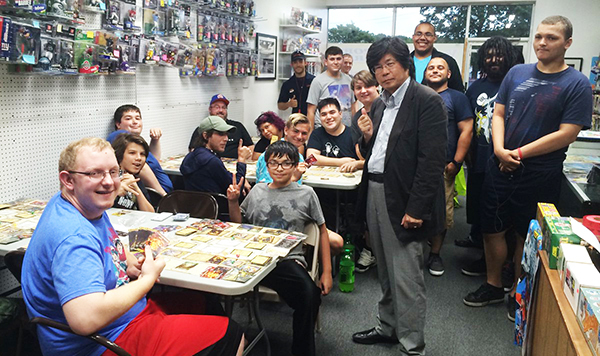 Bushiroad CEO Kidani Takaaki visits a card shop in North America to help with game workshops, July 2017. Bushiroad reports that preorders for V-Booster Set 01: UNITE! TEAM Q4! have increased by over 200% of its immediate predecessor, G-Booster Set 14: Divine Dragon Apocrypha. Preorders are up 213% in North America specifically, with Europe up 153%, and Asia-Oceania up 128%. The sudden spike is likely influenced both by the transition to the new Standard format, which omits cards from before April 28th, 2018, and by the influx of returning cardfighters in anticipation of the new series. Bushiroad had pushed for fighters that left during the Asia Circuit block of the game to return, both by appealing to nostalgia with its 2018 remake of the first season and with its "Time Leap 2012 Fight" introduced at this year's Great Vanguard Festival. In the Time Leap 2012 format, fighters can only use cards printed before December 31st, 2012, and the company specifically encourages those that dropped the game long ago or only have the old decks to participate. 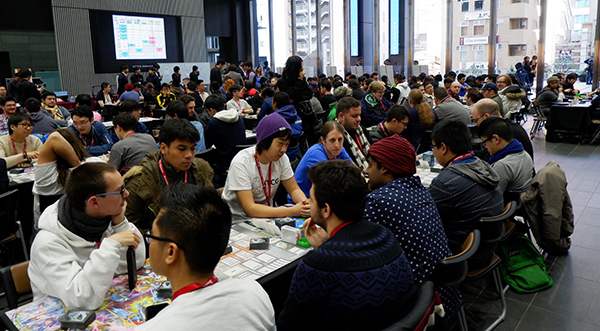 139 players from 28 different countries join in the final leg of the 2017 Bushiroad Championship Series. Although the company has struggled with supply issues in the past, it promises to implement a "wide variety" of measures both domestically and internationally to grow the game into an increasingly globalized phenomenon. The first episode of the new anime series, codenamed "Origin," will begin airing May 5th, 2018, on TV Tokyo and affiliated stations. It will be simulcast with English subtitles on YouTube and Crunchyroll. The accompanying Trial Decks V-TD01: Sendou Aichi and V-TD02: Kai Toshiki will launch in Japanese May 11th, 2018, and in English June 8th, 2018. They will be accompanied by a new sleeve based on the "Imaginary Gift" design. The first Booster Set of the Standard format, V-BT01: UNITE! TEAM Q4! will launch in Japan May 25th, 2018, and in English June 22nd, 2018. The first Extra Booster set, V-EB01: The Destructive Roar will launch in Japan June 29th, 2018, and in July for the English-speaking world.